Join Richard Jones for an evening stroll around some of London's most historic pubs as you follow in the footsteps of Charles Dickens through the old streets and hidden courtyards that have changed very little since his day. 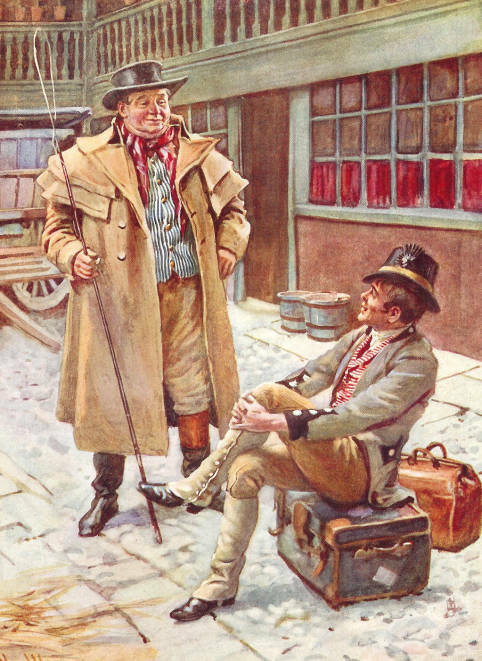 Indeed, were Dickens to return today, he would most certainly recognise these ancient inns and historic taverns and would feel right at home in them! This hugely enjoyable walking tour explores a veritable maze of hidden thoroughfares into which the advances of modern London have yet to penetrate. The pubs that hide away in these timeless backwaters are, likewise, stranded in the past. Loud music, fruit machines and the ubiquitous TV sports channels are about as welcome in these old places as Bill Sikes in a Victorian orphanage! The only sound you will hear when you cross their thresholds is the murmur of conversation as people exchange stories and gossip, much as people have been doing within their time-worn walls for 400 or 500 years. That's how old and special some of these places are. Time capsules, every one of them! Our evening begins within the walls of one of London's most historic and atmospheric taverns - The Cittie of Yorke. Let's be honest, isn't it much better to actually start a pub walk at a pub rather than at an underground station? You can enjoy a meal before you set off, and get yourself well and truly in the mood for the night of fun and fascination that lies ahead. Having met your guide and fellow walkers you will then head off into the night to twist and turn your merry way through some of London's most timeless alleyways, courtyards and hidden passageways. Frequent pauses will be made to allow you to take in your surroundings as Richard regales you with fascinating history and fun facts about the fantastic places you encounter. Before long you will find yourself stepping through an old set of iron gates, into a tranquil courtyard that Dickens featured in his most autobiographical of novels David Copperfield. Here, in this picturesque throwback to bygone London, you will be set a tantalising challenge. For, somewhere amongst the old 18th century houses, there nestles one of London's best kept secrets - one of the Capital's oldest and most hidden pubs inside the cosy rooms of which those fortunate enough to know of its existence, or to stumble upon it by accident, have been imbibing merrily for nigh on 500 years. Oh the tales its walls could tells if only they could speak. Tales from the age of Shakespeare, of a brow-beaten bishop competing with a haughty aristocrat for the land on which the pub now stands. Tales from the days in the 19th century when Charles Dickens might have dropped by for a quick tankard of ale before setting off to explore one of Victorian London's most notorious criminal enclaves that once stood close by. Indeed, we shall then follow in his footsteps through the very streets where the slum once stood in which Dickens set Fagin's lair in Oliver Twist. The slum, and the criminal gangs have long since departed, yet there is a pub here that was, reputedly, the inspiration for the Three Cripples where Sikes, Nancy and Fagin were wont to down a tankard or two. By the time our merry little band of Dickensian tipplers leave this wonderful old hostelry we'll be on first name terms and people who were strangers just an hour or so before will now be seasoned drinking companions! That's the nice thing about pub walks, they're as much a social event as they are a guided tour. We continue our journey by twisting and turning through a maze of streets and passages that bring us to Fleet Street, once the heart of the newspaper industry. 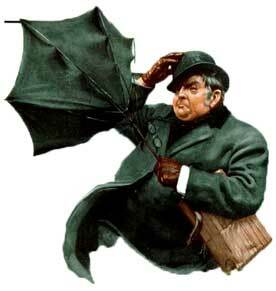 You will see plenty of local landmarks and hear many tales about the history of the streets through which you walk. By which time you will be ready for another pub, and what a treasure this one is. A 17th century hostelry, no less, which was built by Sir Christopher Wren for the workmen who were building a nearby church. 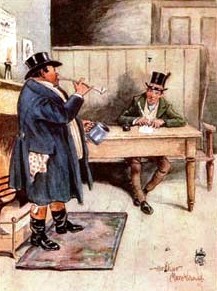 Dickens would, most certainly, have known it, for it is very close the place where he founded his own Daily newspaper. 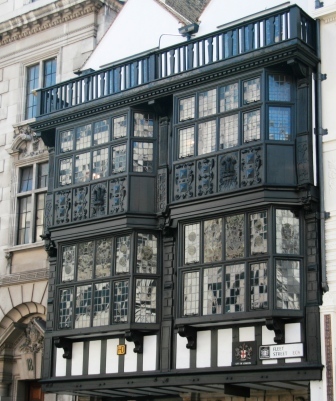 Having strolled through the warren of tiny alleyways and courtyards that snake away from Fleet Street, we cross the timeworn step of a truly historic hostelry that was rebuilt in 1667. With its saw-dust strewn floors, its creaking staircases and wood paneled walls this famous London pub is well and truly marinated in the cask of bygone London. In the past it has welcomed the likes of Sir Arthur Conan Doyle, Mark Twain, Dr Johnson and, of course, Charles Dickens himself. Tonight it will welcome our merry band of time travellers. 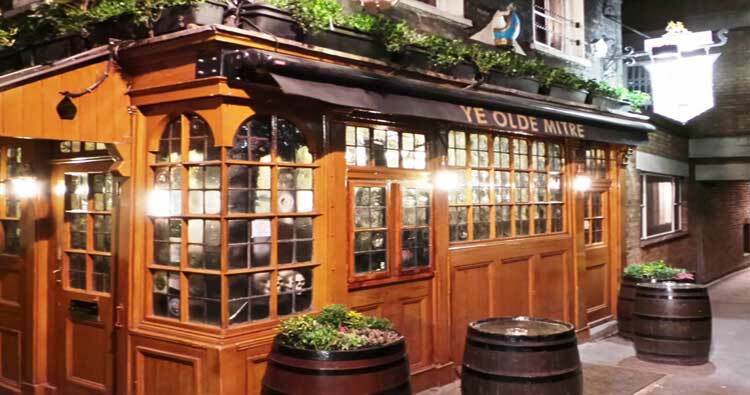 There is no better, or more apt, place to go to to wind down a tour of the inns and taverns of Dickensian London than inside this wonderful survivor from bygone London, so we'll raise one last glass and bid each other a fond farewell. Cheers! So join Richard Jones for a magical and memorable journey back in time on which each step taken, and each pub visited, will bring you closer and closer to encountering the old and historic streets of the London of Charles Dickens. When planning your journey to the start of the Dickens pub tour, please allow 3 minutes for every station you will be through and then add 10 minutes to allow for any travel delays. I've always enjoyed visiting the pubs that we take in on this walk and, to be honest, I just never grow tired of them! I would suggest that you get to the pub early so that you can enjoy a drink to get yourself in the mood for the night that lies ahead. The pub also does food and it is the London pub that I always recommend for my groups who want to end their evening with a meal. The service is good and very fast and, I can honestly say that every group I have taken there have been delighted with the service and the food. Be sure to go and have a look at the main bar. It is more like a baronial hall than it is like a pub interior. There are little booths, which if you can get one, (they do get snapped up early on) are fantastic to sit and chat in. The other pubs we visit are all equally fascinating and, again, I just never grow tired of them. I hold many fond memories of the wonderful people I've met on the tour and to whom I've introduced these pubs to in the 31 years since I first led this tour around the inns and taverns of Dickens London. I hope I get the chance to show you just how timeless these places are and that, once you discover them, you'll want to return time and again. 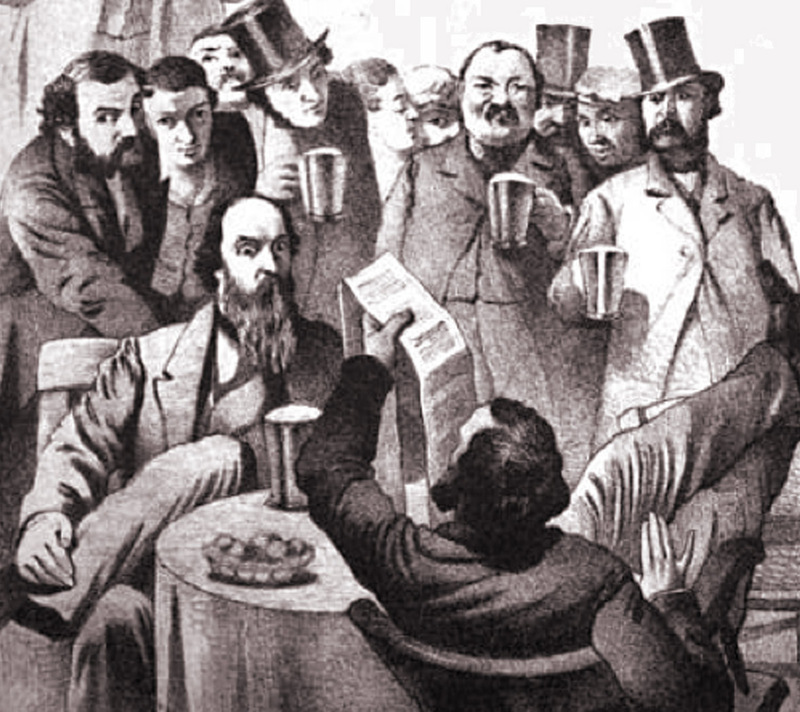 The Dickens Pub Tour can be booked as a private tour for your office social, tour group, or even as an outing with a difference for a group of friends or relatives.